When you look in your closet there’s something missing, isn’t there? There’s an emptiness that you just can’t figure out how to fill. Well, don’t worry about wasting any more time trying to figure out exactly what it is you're missing. We've figured it out for you. It’s the lack of this amazing Caroling Gentleman Costume! Everyone is always preaching about “going green” and we would have to agree because this all green outfit is amazing! You can kindly assure everybody that chivalry is not dead, not as long as you’re strutting around in this classy attire. 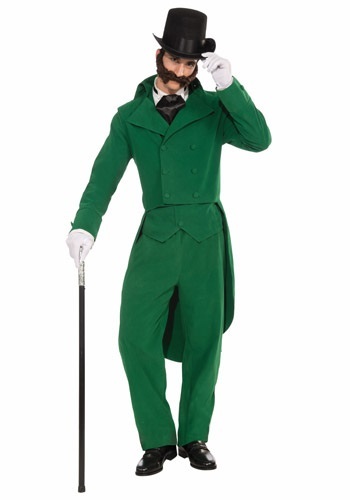 You’ll look like a million bucks as you merrily stroll about town in this gentleman costume. It will be perfect for a fun Halloween costume, you could also toss this on if you plan on doing some caroling this Christmas season, and it would obviously make a marvelous St. Paddy’s getup. This costume is a triple-threat! You can look even swankier when you add a handful of accessories. Grab a cane and a top hat, along with a pair of gloves, and some stylish dress shoes, and you’ll be ready for any upcoming gala event! Finally fill that void in your closet and no longer waste your time wondering when you’ll have the perfect outfit. Add this Caroling Gentleman Costume to your wardrobe and be the classiest as well as the greenest person in the neighborhood. You will look absolutely smashing. Any party scene you enter will instantly be more sophisticated with your presence. Although, you can always lighten the mood when you do the funky chicken out on the dance floor!